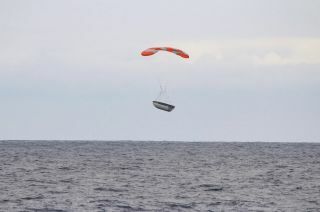 Half of a SpaceX Falcon 9 payload fairing descends toward splashdown in the Pacific Ocean after the rocket’s launch on May 22, 2018. SpaceX hasn't yet plucked a falling payload fairing out of the sky, but it's getting closer. The company's net-equipped boat, Mr. Steven, just missed catching half of the fairing that protected two NASA Earth-observation satellites during their launch atop a Falcon 9 rocket last week, SpaceX representatives said. The 205-foot-long (62 meters) Mr. Steven missed snagging a fairing half by "a few hundred meters" during a February Falcon 9 launch, SpaceX founder and CEO Elon Musk said at the time. Falcon 9 payload fairings cost about $6 million apiece, Musk has said. SpaceX wants to catch and reuse them to help reduce the cost of spaceflight. (Salt water is extremely corrosive, which explains the need for Mr. Steven and its net.) The company already routinely lands and relaunches Falcon 9 first stages, for the same reason. SpaceX tried to catch the payload fairing with a net-equipped boat named Mr. Steven but missed by about 165 feet (50 meters), company representatives said. Indeed, the Falcon 9 that lifted off on May 22 featured a pre-flown first stage. The rocket launched from Vandenberg Air Force Base in California, delivering NASA's twin Gravity Recovery and Climate Experiment Follow-On (GRACE-FO) satellites to orbit, along with five Iridium Next commercial communications satellites. A close-up view of the Falcon 9 payload fairing half. The GRACE-FO spacecraft will help researchers better understand rising sea levels and other changes in Earth's water cycle, mission team members have said. The February Falcon 9 launch that involved Mr. Steven also took off from Vandenberg. On that mission, a rocket with a pre-flown first stage successfully lofted a Spanish radar-imaging satellite and two prototypes for SpaceX's planned internet-satellite constellation, known as Starlink.